It is with a heavy heart that we release this statement: The reception area of Maliba lodge was devastated by fire in the early hours on the 25/07/13, however, thankfully no one was injured. While the cause of the fire has not been established it is suspected that an electrical fault was to blame. However, all 6 Mountain rooms and our River lodge remain safe and intact, and are fully operational. Our reservations team have been working hard to inform all of our guests. 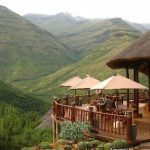 We are pleased to announce that the Maliba Mountain Lodge will be up and running by the beginning of September, as we will be boasting “Maliba Under the Stars”. A temporary but luxury Mountain Safari tent will be placed as our main area and offer guests an exclusive and intimate dining area. Thank you to our staff and guests for the support and we look forward to rebuilding our beautiful reception area. Mountain lodge will be reopening at the beginning of September. Our self catering River lodge is completely separate from the main lodge and has not been affected. Please follow us on our facebook page for updates and photos as we rise from the ashes and rebuild our main area. Please contact Siphiwe and Nicole for further information and questions.